Take 2 onions and chop them finely. Take these finely chopped onion pieces into a plate and keep aside. Grind the remaining 2 onions and keep this onion paste aside. Now grind coriander leaves, green chillies and coconut grating. Again take this paste into separate plate. MAke tomato puree out of the tomatoes. Keep all these pastes, onion pieces and tomato puree aside. Now take the payas, i.e leg pieces and keep them thoroughly. Place these leg pieces into cooker. Now add 1 liter water, turmeric powder and salt to it. Now close the lip of the pressure cooker and allow it for cooking up to 10 whistles. Meanwhile, take a pan, add oil to it and heat it on a medium flame. Now add Elaichi, cloves, bay leaf and cinnamon to it and stir it. Next add ginger garlic paste to it and fry it for couple of seconds. Next add the chopped onion pieces to the pan and fry them till they turn in golden brown colour. Next Onion paste to it and fry it too. Now add coriander powder, garam masala, crushed pepper pieces, and red chilli powder to it and fry it for a minute. Remove the lid of the pressure cooker and pour this complete masala in the pan into the pressure cooker. Next add the tomato puree to it and mix well. Allow it for cooking for about 2 minutes under low flame. Now add the chilli-coconut paste, and 500ml of water to it. Close the pressure cooker lid and cook it for another 10 whistles. Once the cooker is cool, take it into a separate bowl. 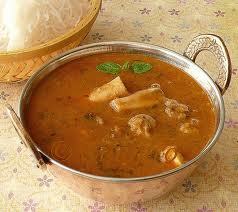 Your Mutton paya is ready to get served. Boil meat with salt, ½ onion, ginger, garlic paste, then heat the oil fry ½ onion add tomato, ginger, garlic all masala bhuno well add 1 cup water and mutton. When oil comes on top add curd, bhuno, add ½ cup water, add podina cook for 5 minutes, garnish with podina, green chili and onion rings.